Zines (pronounced zeens) are self-published magazines, fanZINES, mini-books, or mini-comics that are often small in size and short in number of pages. The beauty of a zine is that you can create one with nothing more than a pen and a single sheet of paper. Then you just need a ream of paper and access to a photocopy machine, and you’re in business. Making a zine is an immediate and enjoyable DIY book publishing operation that anybody can do, and it provides an unparalleled exercise in editing. Talk about fun for the whole family! The simplicity of making, reproducing, and distributing zines is the reason they’ve historically been associated with counter culture. However, those same reasons are also why they’ve gained so much popularity in contemporary mainstream culture. And since zines have become a widely popular form of short storytelling, their reputation as a means to distribute subversive material has diminished. What you decide to publish in your zine is your business, however. I’m simply providing you the directions on how to create an 8-page zine using a single sheet of copy paper. There are no rules to making zines, just like there are no rules to creating art. That said, we’ve all seen bad art or read a terribly written book. Believe me when I say I’m as guilty as anybody for creating works of catastrophe throughout my artistic (wannabe) career. Fortunately, I have the capacity to learn from my mistakes … at least sometimes! What I’ve found is that clarity is paramount when creating any type of art. Although a lack of technique can definitely make for poor looking or sounding art, the biggest offense to your audience is when you’re unclear or confused about what you’re trying to say. Like when someone tries to describe their dream, but gets lost in thought simply trying to formulate a coherent sentence. Use your words! Get to the point! Stop wasting my time! The bottom line is that nobody wants to watch a dude on stage noodle around on his guitar for 15 minutes. Play us a song or get off the stage because we all have far better ways to spend our time. This video will show you how to fold and cut the 8-page zine (using a single sheet of paper). Settle on a singular message for your zine and be as clear as possible about this statement. Your message doesn’t need to be profound or “enlightening.” It just needs to be clear. This is especially important for the 8-page/single sheet of paper zine I’m describing because it’s both small in physical size and page count. If you want to go big with your zine, use a larger sheet of paper and fold it in the same way as the standard version. But always remember that it’s generally best to keep things simple. Creating zines can be as low-tech or high-tech as you want but ultimately zines are books and, therefore, are a microcosm of book publishing. 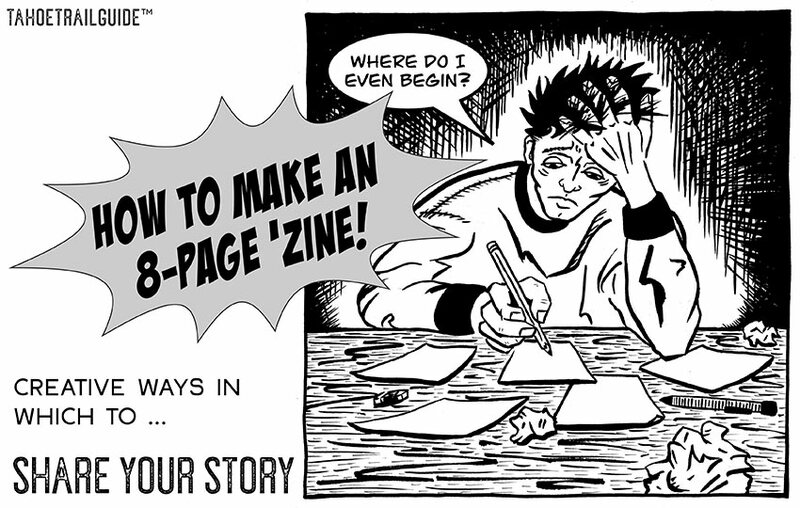 So I’ve briefly listed some broad steps of making a zine/book to get you started. Keep in mind that even though I’m presenting these topics as a numbered list, you should realize that they need to be considered simultaneously at all times in order to create something dynamic and engaging. Having a plan is essential for completing your work, but adhering to a rigid formula creates uninspired and potentially disconnected artwork. Why do you want to say it? You don’t need to make a profound statement, but you should attempt to be as clear and focused as possible when trying to express whatever it is you’re saying. Not only will this enable you to use your time and resources as efficient as possible (because you’ll know exactly where you’re going), it should also find favor with your audience because they’ll (hopefully) receive your message loud and clear. Write down your story first (or at least an outline of it), because it will provide the basis for your visual elements and inform the overall design of your zine. What are the best visual elements to make your point? What visually-oriented skills do you possess that you can enlist in expressing your message (drawing, painting, photography, collage, digital image manipulation)? What is the most effective design or arrangement of your text and visuals that will yield the clearest message? Since you’re working with limited space on this 8-page zine, you’ll have to refine what it is that you include in it. Although you may create or find a dozen images that you like, you’ll never be able to effectively fit them all into such a small book. Narrow your selection down to a few images that provide the most impact with regard to telling your story. Consider the size of your text with relation to how many words you can include on each page. Large handwriting or fonts will make your zine easier to read (especially during reproduction), but limit the amount of text you can include. Smaller words allow you to include more text, but it may be difficult for people to read and it may not reproduce well (especially when photocopying). The low-tech option of creating this type of zine is to draw and write every aspect (or collage found images and words) on one sheet of paper and then photocopy it. The high-tech option would be to isolate each element on the computer and create the finished product in a digital environment such as Adobe Photoshop or Illustrator, then print it. This topic is way too complex to go into today. So based on your current skill set and available tools, choose whatever path that yields the best results using the least amount of effort. Is this a personal project only meant to be shared with family and friends? Is your zine part of a viral marketing campaign meant to see worldwide distribution? Is your statement being used to educate a specific demographic, or to be used in an educational setting such as a classroom? Who you intend to share your zine with informs how you will reproduce and distribute it. If it’s just a fun project to create with your kids on a rainy Saturday afternoon, choose the low-tech method. On the other hand, if you’ve just developed the latest and greatest video game and want to design supplementary material for use in marketing it, choose the high-tech option. This will give you maximum flexibility, enabling you to be as detailed and focused as possible when creating your zine. I understand this overview introduces some larger artistic concepts that require more attention than what I’ve given them here. However, my goal is to provide you food for thought as to how you’d like to approach telling your next story. Among many things, zines are a fantastic way to create a quick snapshot of your latest outdoor adventure or help to document in a unique way your summer family vacation to Europe. In future Share Your Story installments I will demonstrate some of the more advanced concepts mentioned in this article, as well as how to create more complex zines. For now, however, have fun experimenting with making this small, 8-page zine from a single sheet of paper. I designed this zine titled “A Lesson in Preparation” while teaching an after school group of kids at the local Boys & Girls Club. I wrote the text in a notebook and sketched the artwork on a page of paper in the classroom (hence it having a loose and hasty look). Then when I got home, I scanned the artwork into Photoshop and added the text digitally. Click to open a larger version of this template in a new window, then select “save image as” to download it for printing. The following zine is clearly more complex than the example above. 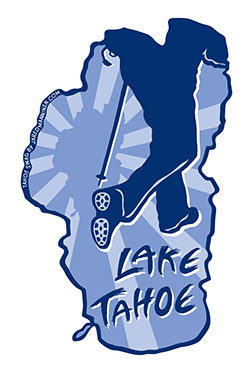 Years ago I worked on a short series of Tahoe-related history comix. I assembled this zine digitally (using elements from some of those comix) so that I could resize each element as needed. I then handed out the zine at events in which I sold the history comix. The last example I’m offering of this type of zine is called Unexpected Refuge: A Lesson in Humor and Humility, and was about my failed attempt at hiking the Tahoe Yosemite Trail in 2015. Visit the page to read and/or download the zine. Here is an older video of me describing how to fold and cut this type of zine. Upon re-watching this, I realize that I was too verbose in my presentation and provided more information than is necessary. What can I say, though? I gave it the ‘ol college try.